Blogger and brand relationships can be tricky to navigate. Oftentimes brands treat the relationship as they would a PR initiative or choose to sample products and donate items to bloggers for feedback, reviews, and exposure — only to find that nothing comes of it or that the response was not favorable. Bloggers want to remain editorially sound, which means that brands looking to create meaningful relationships with bloggers need to have a definitive strategy and dedicated resources who are focused, disciplined, and track against concrete goals. Recently I’ve seen a few examples of how blogger and brand relationships have evolved and become more meaningful. OXO is a brand that I would argue is omnipresent in many homes but not top of mind in most. Their ergonomically correct kitchen tools like can, bottle, and jar openers and inventive kitchen organizational tools make it easy to be efficient in the kitchen. In a competitive and somewhat commodity-driven market, they strive to be the best in product development and design. And they take it a step further by soliciting feedback from those who use their products most. OXO developed a Blogger Outreach strategy for “bloggers to test and review new and existing products, receive exclusive video content, get behind-the-scenes access to the OXO product development process, attend exclusive OXO events and much more.” Arianna Bastianini leads the initiative, and I had a chance to speak with her at the Housewares Show to learn about her approach to building these personal relationships. In addition to spending a week in Chicago this month, Arianna is headed to the Food Blog Forum event in Orlando to participate in a panel entitled PRspectives, an inside look into the process of working with brands and forming beneficial relationships. For Arianna, the keys are authenticity, dedication, and a keen understanding of the goal of the blogger initiative. Because of her focus, OXO has learned a lot about their products in practice and how to increase their value to consumers. share the data captured by the devises, especially on Marathon Day. Much like the OXO strategy, the brand is looking for authentic and usable information that may help improve the product or the product launch strategy. Polar is relying on a trusted media source, Boston.com, to find their advocates. Partnering with a publisher that already has credibility and audience reach is a key tenet of the Tippingpoint Labs Brandscaping model. Using the publisher to audit the responses can be tricky unless the brand and publisher are very well aligned in the exact goals of the blogger strategy. Boston.com may find one applicant more credible because they write well, but Polar may appreciate the runner who runs 10+ miles a day and therefore has less time to write comprehensive reviews. The brand / publisher relationship needs to be well established in order for the Polar blogger campaign to be effective. I think OXO and Polar USA could learn a lot from one another. Polar USA should not be afraid to reach out and develop their own blogger strategy much like OXO. However, both brands could do a better job of aligning with other complementary brands in order to expand their reach and audience participation. Polar USA and Boston.com could easily align with Gatorade or Nike or Camelbak to gain more momentum with superior athletes and gather information beneficial for all brands. 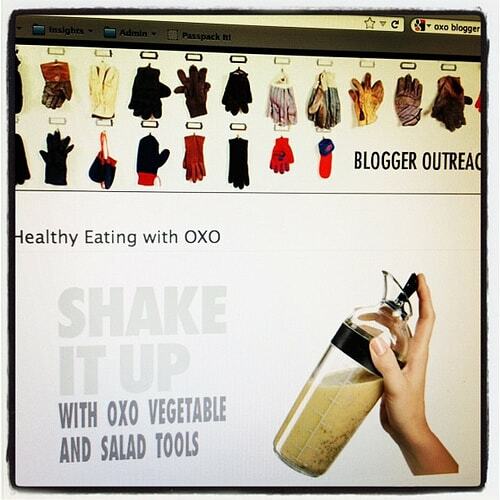 OXO could align with Nestle’s or Quaker or Real Simple to broaden their blogger outreach strategy and develop a honed group of elite bloggers who take their kitchen and cooking as seriously as OXO takes product design. Bottom line: there are limited bloggers who add value to a brand relationship. Brands should not compete for those valuable bloggers. Partner and win loyalty through better blogger strategies and complementary brand alignments. …the Boston.com article is removed, here is a screenshot of how Matt Pepin solicited runners to participate in the Polar test-drive.